Note: This is a brief transcript of actions related to my recent hard disk crash recovery. I'm publishing it here in the hope it might be of use to someone someday, just as all those similar posts out there are every so often of great use to me. So if you, dear reader, are not really interested in replacing a hard disk of your DELL PC, you better save your time and skip to the next post. A pair of days ago I accidentally managed to test what happens if you throw a running 3-year-old DELL XPS M1210 laptop from a height of about 1.3 meters against solid floor. The result, fortunately, was radically different from what one might expect after observing that painful inelastic crash. After switching the screen off for a period of 5 seconds or so (the reasons behind this behavior being a complete mystery for me) the laptop happily resumed as if nothing had happened. A later examination revealed that the only part that was damaged was the hard disk where a number of files became unreadable. I presumed that it must have been the result of a strong head crash. Common knowledge suggests that a head-crashed hard disk should better be replaced, even if it continues functioning. This is because new head crashes are much more probable after the first one has happened. Thus, I went to the shop and got myself a new average-grade 160Gb SATA hard disk (these are surprisingly cheap nowadays, btw). I also bought a small external case to put my old drive into, so that I could continue using it as an external storage medium. In principle, the whole procedure could have ended here: I could have taken the old hard disk out, put the new one in, installed the OS onto the new disk from a CD and copied my files from the old disk with the help of the external case. However, there was one thing I didn't like about this approach. If I were to restart with a blank OS, I'd have to bother installing the proper drivers as well as several pieces of software that were shipped with the factory preinstallation of Windows XP (in particular, that enormously useless yet really impressive Logitech Video Effects webcam feature). I knew, however, that there was a way to restore the disk to the factory setting so I went on to figure out how to do it for a new hard disk. In hindsight, the whole procedure is actually rather straightforward, at least if you appreciate the virtues of the dd command. It seems that most DELL laptops nowadays come with a "DELL System Restore" feature, which means that there is a hidden partition on the hard disk that stores the factory-installed Ghost image of the system drive. If at boot time you press Ctrl+F11, you get the opportunity to write this image to disk thus destroying all your data but bringing the computer to its retail state. The hidden partition is labeled DellRestore and besides the image file it contains a bootable DOS operating system (yes, real DOS! ), the program for restoring the Ghost image (restore.exe) and an autoexec.bat script that invokes this program on boot. So, if I'm not mistaken, by pressing Ctrl+F11 you just direct the laptop to boot the DellRestore partition. In theory, if you mirror the partition structure of your old hard drive on the new one and copy the data of the DellRestore partition, it should be possible to simply put in the new drive and press Ctrl+F11 for a proper restoration. However, my new drive was larger in capacity than the old one so I didn't want to mirror the partition structure exactly and I ended up with a somewhat more complicated procedure. The following is an approximate list of steps I went through. Don't try repeating them unless you really understand everything, though. You are also strongly advised to visit this site first. I needed two bootable CDs here: one Knoppix Live CD and one DOS bootable CD. First, keep the old (damaged) hard disk in the laptop, put the new disk into the external case, but don't plug it in yet. 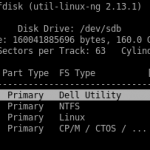 It should have 3 partitions: DellUtility (sda1), the main NTFS partition (sda2) and DellRestore (sda3). Write down their sizes and quit cfdisk. and create a partition table for the new disk that mimics the one of the old one. In my case I created the first DellUtility partition of the same size and type as was sda1. I then added one NTFS partition (for the main Windows OS) and a small Linux partition (just for fun) choosing the sizes of both to my liking. Finally the fourth partition was created of the same size and type as sda3. See Figure. Copy the data of sda1 to sdb1 and sda3 to sdb4. Copy the master boot record of the old drive to the new one. remove the old disk from the laptop, take the new disk from the case and put it into the laptop. Now boot the DOS CD. This should initiate the restore process and write the factory image to your second partition. After the restore process completed I somewhy still had the problem that the system would not boot. I booted Knoppix, opened the partition table (cfdisk /dev/sda) and discovered that the bootable flag of the second partition was gone after the restoration process. Making the partition bootable again and restarting fixed the problem. I've always wondered how is it possible to make a screenshot in text-mode? If I understood correctly you shot your partition table while in dos, right? Also e.g. there are BSOD shots on the web. One could always image-edit the thing, but that's not elegant. So how did you do it? The only way of making a proper screenshot in text mode I know of is by using a camera :). A comment on making screenshots of BSOD and kernel panics: I think they are usually done by running OS in a virtual container (e.g. coLinux, vmware or xen). This is the easiest "elegant" way. Yep, but then you'd have to "artificially set up" the whole BSOD in the virtualized container in the first place. It'd be easier just to make up the corresponding "screenshot" in a graphical editor.